On Sunday morning as we prepared for church, I was not having a good day. Greg and I had been arguing, my body was reeking havoc on me, and it seemed like all I could do was burn bread (mountain pies, biscuits, and French Toast, to be specific). As I ate the “skinny bananas foster French Toast” that my mom helped me make (so I wouldn’t burn it), the TV played in the background. In front of the TV, my two beautiful children ran back and forth, squealing with delight as their cousin Matthew chased them about. They were happy, and had no idea what was playing on the TV behind them. The NBC morning news show was replaying scenes from Martin Luther King, Jr.’s “I Have a Dream” speech. A blue line of words told me that this week (today, in fact) would mark 50 years since that speech. My angry/sad/tired tears suddenly turned into happy tears. I was reminded of a night a ‘lil over five years ago when I first really heard those words. It was on Martin Luther King, Jr. Day in January 2008, a year that changed my life in many ways. Again, the television was playing these words, and again, tears came to my eyes. Although I was raised to believe in equality, my eyes were finally opened to the opportunity and the possibility of equality. Of being accepted for whomever I loved. Of not having to live in a country where I could love someone of a different race and it mean I was welcomed and loved. Little did I know that by that same weekend the next year, I’d be considering finding out what it meant to be in love with a man who was King’s dream and that we’d soon be raising children together “in a nation where they will not be judged by the color of their skin but by the content of their character”. And I am so glad that Greg and I did fall in love and were willing to navigate this crazy world together. Later on Sunday morning, I shared with my dad’s church family that I feel so blessed to be welcomed by people and able to worship in a place where the fact that we are an interracial family doesn’t matter. I shed tears as I looked down at my ‘lil man, seeing the beauty of his biracial skin, hair, and eyes. This ‘lil man knows nothing of oppression, anger, and hate–and I hope to keep it that way. 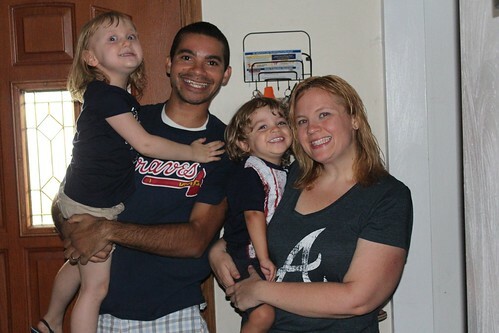 As a couple, we have been blessed with a family that loves us, regardless of skin color. We’ve found a place to worship from time to time that sees beyond Greg’s deeply tanned skin and Evan’s beautiful curls and sees a family that loves each other. We’ve found a place to live where we are not attacked, stared at, or discounted because of our love. We’re living the life where “little black boys and black girls will be able to join hands with little white boys and white girls as sisters and brothers”. We may only be one small part of the 15 percent (of interracial families in the US), but we are living this dream and will do everything in our power to ensure this dream carries on through our kids’ lives. And it feels damn good to live out Martin Luther King, Jr.’s dream. Martin Luther King, Jr.’s “I Have a Dream” speech was given on August 28, 1963–50 years ago today. If, for any reason, you have not heard it before, you can read it on American Rhetoric. This entry was posted in About Us and tagged dream, interracial family, Martin Luther King Jr., Speech. Bookmark the permalink.